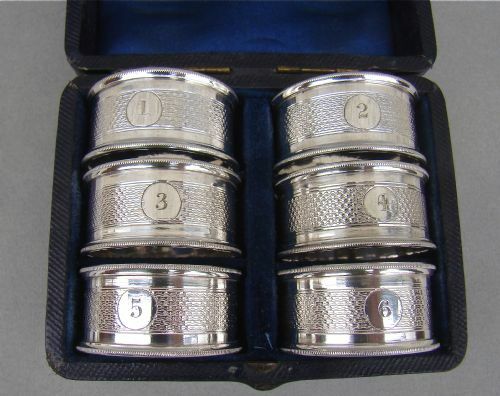 This is a very decorative and complete cased set of Victorian silver plated napkin rings, numbered from 1 to 6. The front of each napkin ring with fine engine-turned decorations, surrounding a numbered medallion. The back modelled as a belt buckle. They are presented in their original maroon leather case, with a purple satin and velvet interior. Diameter: 4 cm / 1.5 inches. Height: 2.5 cm / 1 inch. The napkin rings are in very good condition with no base metal showing and crisp engravings. The box is in good condition, a little scuffed as one would expect for a box over 130 year old. This exquisite Edwardian solid silver napkin ring was made by John Rose and is dated Birmingham 1906. The engraved body within raised ovolo borders. Vacant cartouche. Presented in a leather box lined with velvet and satin. The napkin ring itself has a good silver gauge, a lovely quality napkin ring beautifully presented. J R for John Rose. Diameter: 4cm / 1.5 inches. Weight: 23g / 3/4 of an ounce. 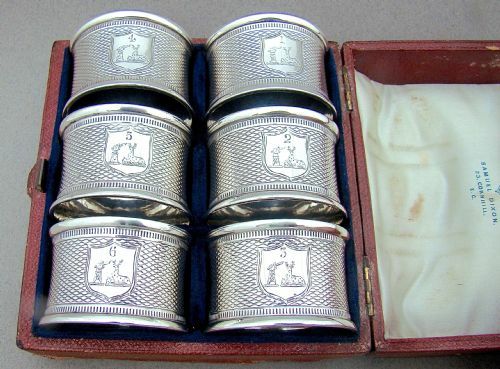 This is an exquisite and complete cased set of mid Victorian solid silver napkin rings, bearing an armorial crest and numbered from 1 to 6. 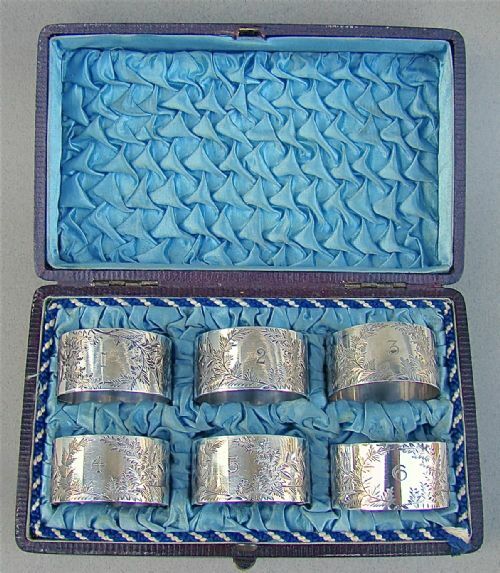 Early Victorian cased set of napkin rings are very rare and this is a superb example. Each napkin ring of slightly waisted form with fine engine-turned decorations, surrounding a shield-shaped cartouche. The cartouche engraved with an armorial crest under the number. They are presented in their original maroon leather case, with a cream satin and velvet interior. Diameter: 4.5 cm / 1.6 inches. Height: 3 cm / 1.2 inches. The napkin rings are in very good condition with crisp engravings. The box is in good condition, a little scuffed as one would expect for a box over 150 year old. 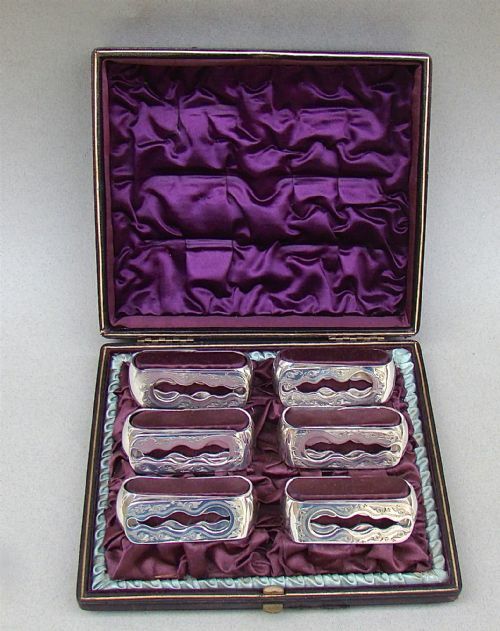 This very stylish and unusual set of Edwardian silver napkin rings is hallmarked for Birmingham 1910 and was made by the prolific Gorham Manufacturing Company. Each napkin ring of waisted form with central girdle and egg and dart borders. 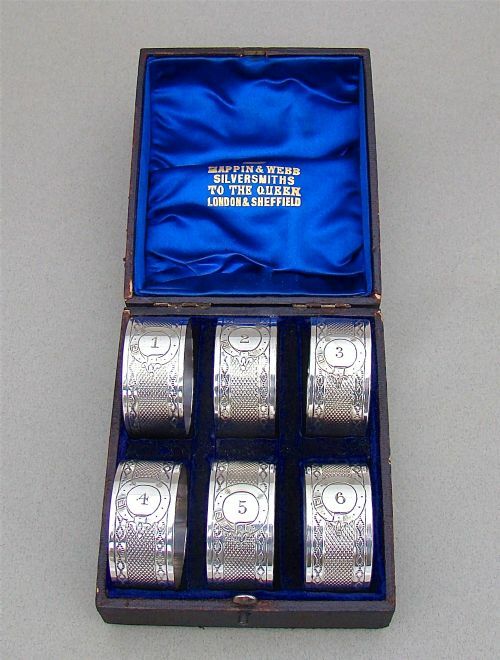 Numbered 1 to 6 and presented in the orginal leather box lined with blue velvet and satin. They have a good silver gauge. Diameter: 4cm / 1.6 inches. Height: 3cm / 1.2 inch. 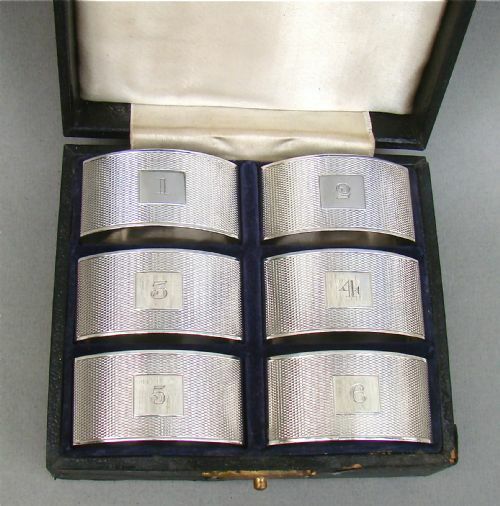 This very stylish and unusual set of Art Deco silver napkin rings is hallmarked for Birmingham 1936 and was made by the prolific William Neale and Son. Each of elliptical form with canted corners and fine engine turned decorations surrounding a numbered reserve. Numbered 1 to 6 and presented in a leather box lined with blue velvet and cream satin. W.N.LTD for William Neale & Son Limited. Date letter "M" for 1936. Length: 5cm / 2 inches. 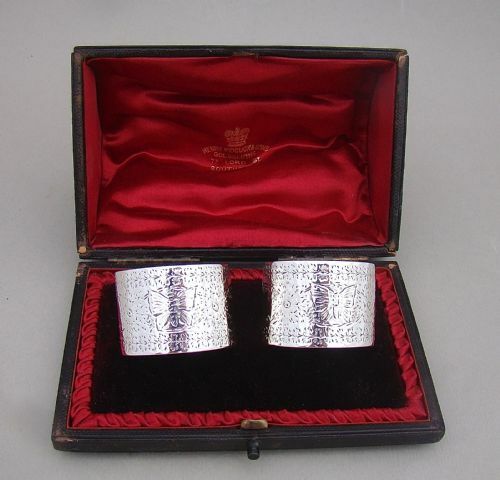 This fine quality pair of napkin rings are hallmarked for London 1895 and made by George Maudsley Jackson. Each beautifully engraved with butterflies amongst sprigs of flowers surrounding two vacant circular reserves. Presented in their original leather case, beautifully lined with red velvet and satin. They have an excellent silver gauge. GMJ for George Maudsley Jackson. Date letter "U" for 1895. Excellent. Clean, not mis-shapen, not engraved. Diameter: 4cm / 1.4 inches. 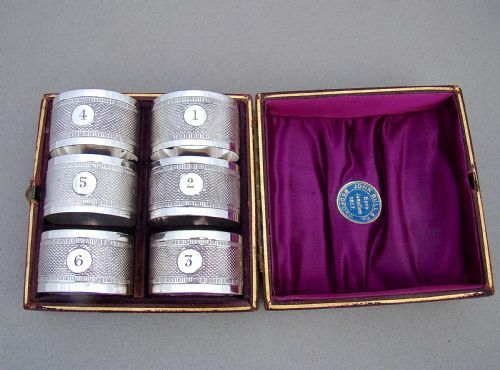 This is a very decorative and very unusual complete cased set of Victorian silver plated napkin rings, numbered from 1 to 6. Each napkin ring with a centre swivel button. One side engraved with foliate decorations, the other numbered and impressed with "PROV PATENT", meaning the design was patented. They are presented in their original maroon leather case, with a purple satin interior. Length: 6 cm / 2.2 inches. Height: 2 cm / 0.6 inch. Box: 16 cm x 15 cm / 6.2 inches x 5.4 inches. The napkin rings are in very good condition with practically no base metal showing and crisp engravings. The box is in equally good condition. Each napkin ring engraved with foliated sprigs surrounding a numbered medallion. They are presented in their original maroon leather case, with a ruched blue silk interior. Diameter: 4 cm / 1.4 inches. Height: 2 cm / 1 inch. The box is in excellent condition. 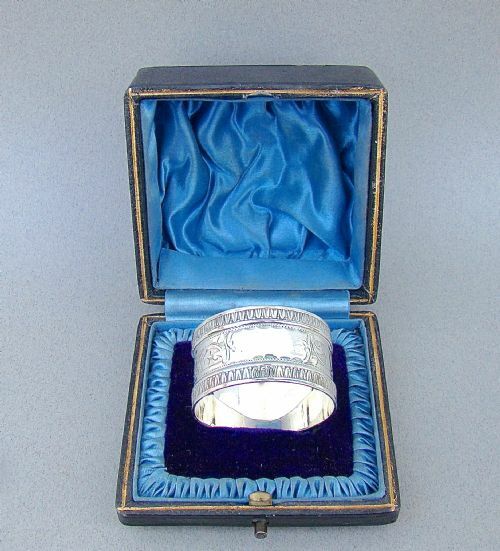 This fabulous silver napkin ring is dated Birmingham 1910. It has a very distinctive trapezoid form. 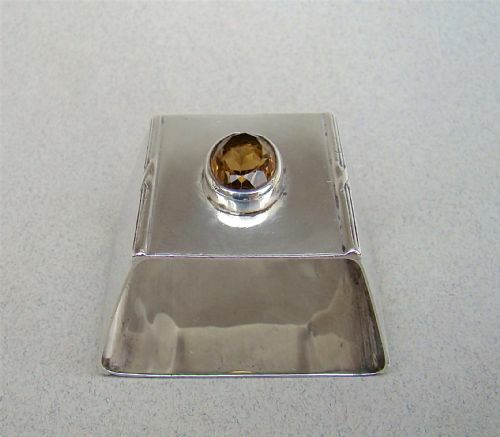 The top of the napkin ring inset with a cut citrine stone. The sides with ribbon-tied borders. It has a very good silver gauge. RC for Robert Charles Culverwell. Length base: 5cm / 2 inches. Length top: 3 cm / 1.2 inch. Width: 3 cm / 1.2 inch. Each napkin ring with fine engine-turned decorations within beaded borders, surrounding a numbered medallion. 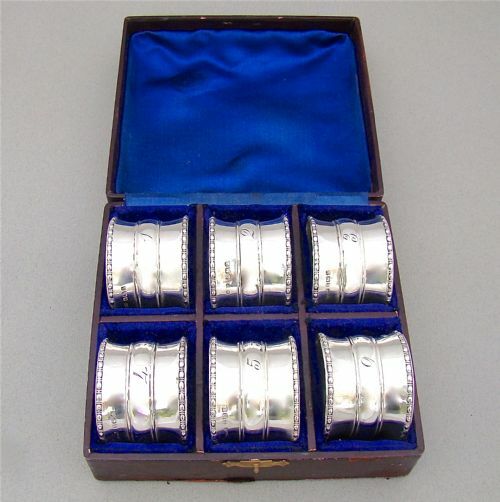 This is a fabulous complete cased set of Victorian silver plated napkin rings, numbered from 1 to 6. Each napkin ring with fine engine-turned decorations surrounding a numbered medallion. They are presented in their original leather case, with a dark blue satin and velvet interior. Napkin rings: 4 cm diameter. The napkin rings are in very good condition with no base metal showing. The box is a little worn at places. 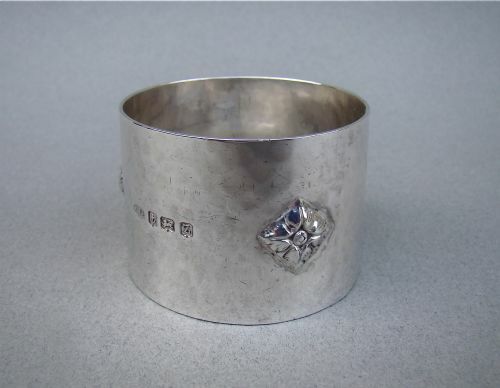 This fabulous spot-hammered silver napkin ring was made by the celebrated Arts & Craft silversmith A.E.Jones. A. E. Jones was one of the major figures of the Arts and Crafts movement. It has a very good gauge of silver, testimony of its quality. The spot hammered body applied with three stylised flower heads in a lozenge. A.E.J. for A E Jones. Date letter "z" for 1924. No dings. No dents. No inscriptions. Weight: 36.6 g / 1.3 oz.